Positive Behavior Interventions and Supports (PBIS) is a proactive approach to establishing the behavioral supports and social culture and needed for all students in a school to achieve social, emotional and academic success. 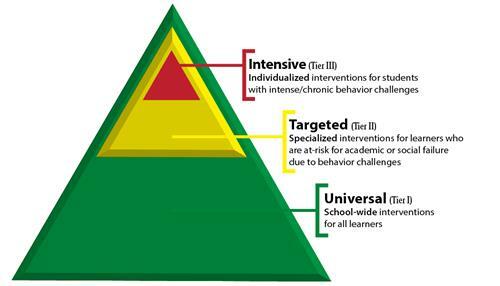 Attention is focused on creating and sustaining primary (school-wide), secondary (classroom), and tertiary (individual) systems of support that improve lifestyle results (personal, health, social, family, work, recreation) for all youth by making targeted misbehavior less effective, efficient, and relevant, and desired behavior more functional. At SCC, PBIS looks different at each building. Check out each section below to see how each level is incorporating PBIS into the school for the betterment of the students. Also, if you would like more information on PBIS and how it works, you can check out the links near the bottom of the page. At the elementary level, PBIS uses a different character trait each month to focus and grow student behavior. Students who exemplify that trait are chosen as students of the month, with a special assembly to recognize them held each month. Reteaching opportunities are held for students who struggle to understand expectations. Expectation Passport This is our "passport" that we use to teach expectations to children at the ES. The middle school is just beginning their PBIS journey. We will attempt to grow what is being done at the elementary level into expectations that fit with the crazy middle school years. Wisconsin PBIS Network The Wisconsin Positive Behavioral Interventions and Supports (PBIS) Network operates within the Wisconsin RtI Center with a specific focus on behavior. Wikipedia Article on PBIS Provides a nice overview of what PBIS is in a broad context. Check out the "Notes and references" at the bottom of the page for more great sources. Technical Assistance Center on Positive Behavioral Interventions and Supports Established by the U.S. Department of Education to define, develop, implement, and evaluate a multi-tiered approach that improves the capacity of states, districts and schools to establish, scale-up and sustain the PBIS framework.